Texas Senate Republicans passed a resolution Tuesday declaring a crisis at the Texas-Mexico border and requesting that Congress fully fund "all means necessary" to secure it. The resolution sparked ire from Senate Democrats, who said the first time they saw the measure was on the Senate floor. Senate Resolution 535 passed in a party line vote, 19 to 12, late Tuesday afternoon. The resolution doesn’t prescribe a specific border security solution but asks Congress to deploy agents, implement technology, and “erect barriers where needed.” It also states that the “Texas Senate supports the President in his efforts to move forward with emergency action” – a line that angered multiple Democratic senators. 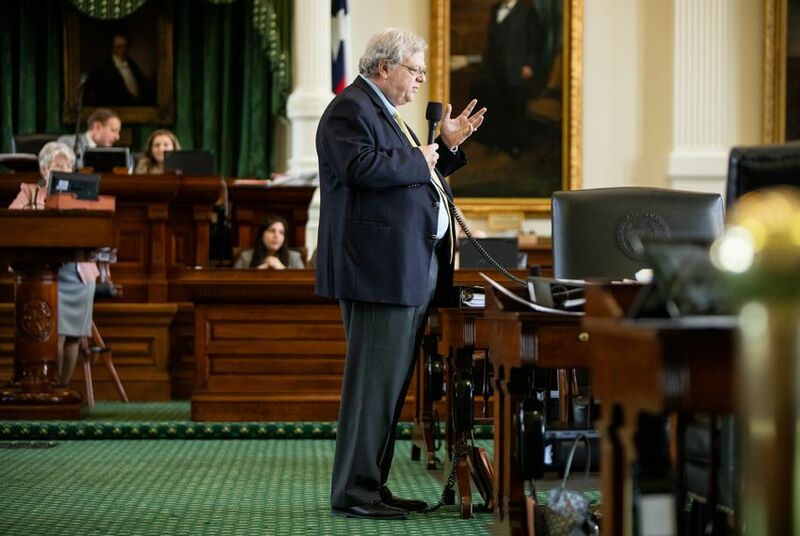 State Sen. Paul Bettencourt, R-Houston, moved on Tuesday to bypass the Texas Senate’s rules to discuss the measure, which he coauthored with the rest of the Senate Republicans. "I think there’s no question that, speaking with a voice that recognizes the obvious, there is a crisis at the border,” he said. Democratic senators rebuked Bettencourt's move, saying they were surprised by the measure and prevented from testifying on it because it didn't go through the normal committee process. But Bettencourt said the urgency of the crisis required a rapid response. He repeatedly echoed one of the lines in the resolution: the U.S. Department of Homeland Security predicts that 100,000 migrants would be intercepted at the border in March 2019, the highest monthly total in a decade. State Sen. Royce West, D-Dallas, moved to refer the bill to the Veterans Affairs and Border Security Committee, but the motion failed in a party line vote. Sen. John Whitmire, D-Houston, implored Bettencourt not to “burn the whole afternoon” on the border security issue — which took three hours to debate before senators voted — and instead focus on pressing state issues like school finance or property taxes. "The crisis is in our inner cities,” he said. "If you’re going to be the crisis patrol, there are crises that exist much larger than the one that you’re describing on our border." Laredo Democrat Sen. Judith Zaffirini asked whether Bettencourt consulted any of the four Democratic senators who represent border districts. Bettencourt said he only consulted Republican colleagues who coauthored the bill. Republican senators repeatedly invoked human trafficking at the border. Sen. Joan Huffman, who has championed the cause this session, said the U.S. Congress has neglected its duty to address the border security issue. McAllen Democrat Sen. Juan “Chuy” Hinojosa offered an amendment that would urge the federal government to stop separating families at the border and to “humanely process” refugee and asylum seekers. Initially, Bettencourt opposed a similar amendment by El Paso Democrat Sen. Jose Rodriguez, but he eventually adopted the measure in his resolution. Other Democratic senators unsuccessfully attempted to tack on amendments that would urge Congress to oppose other Trump administration policies, such as the refusal of foreign aid to Central American countries and the diversion of military construction money to fund a border wall. One amendment would have deleted the phrase "erecting barriers where needed," but it also failed. Bettencourt said the measure will be entered into the congressional record after the resolution passed.